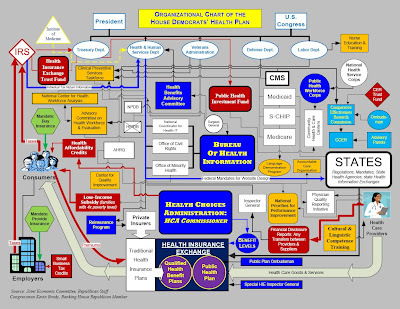 House Republicans are passing around a new flow chart that shows the maze of Government Bureaucracy that would be the consequence of passing President Obama's Government Health Care Plan. Rep. Kevin Brady of Texas developed the chart. We all know that America's healthcare essentially is a choice between high taxes/universal healthcare, or low taxes/pay-for-your-own healthcare, and Obama's choice being the former. However, in Singapore, we have low taxes/universal healthcare. On top of that, Singapore is a country with no natural resources (such as crude oil) to fund the country's endeavors in this aspect. They are merely astute, pragmatic and efficient at decision-making and operations. America should take a page or two out of Singapore's healthcare system. Or even South Korea's as well. Yet, I think America's system is destined for failure given the massive complexities in instituting a top-down program from the federal level. The bureaucracy needed to implement such a program across diverse populations and varying state laws creates unparalleled costs. Frankly, I take a look at the two places in America I hate going to most: the post office and the DMV, and conclude a federal health care program will be no different in its efficiency.